The Phantom is intended to be a stepping stone towards future UAS. Army accepted delivery this week of the DJI Phantom UAS, a training drone set to be rolled out throughout the entire organisation, including Reservists and Cadets. 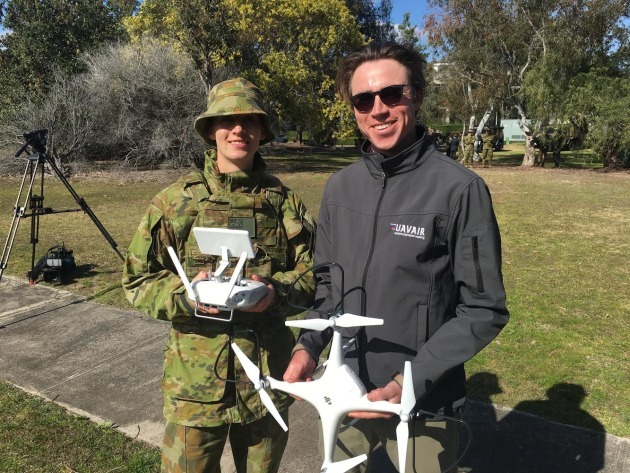 Sydney-based personnel of the 17th Combat Service Support Brigade (CSSB) received a DJI Phantom 4 UAS as part of the Army’s plan to issue 350 of the systems. ADM sat down with LTCOL Kierin Joyce, SO1 UAS, COL Gabby Follet, CO of 17 CSSB, and David Mann of UAVAir, the Newcastle-based training provider, to talk about the latest UAS to enter service. The mention of drones normally conjures images of armed Reapers floating above the mountains of Afghanistan. The Phantom, however, looks like something you’d buy in JB Hi-Fi. The acquisition aims to catalyse drone proliferation across the Army by helping soldiers develop what COL Follet calls “drone literacy” using a relatively cheap, commercial off-the-shelf platform. “Drone literacy is every soldier and commander understanding what a drone can do for them. What the possibilities are, how to pick the right drone for the mission,” COL Follet said. For COL Follet, UAS technology is a game-changer for sustainment operations. "We can see a future where these drones are part of our sustainment operations. We could have a large convoy with drones flying to the front, to the flanks, to the rear. That means our situational awareness is that much greater. According to COL Follet, the off-the-shelf acquisition is also motivated by the need to wield market influence and stay abreast of the latest developments as the technology accelerates. “Drones are evolving really quickly,” COL Follet said. “We’ve got to be part of that. We have to be experimenting with these things so we drive the technology to where we want it. “If we’re not building our own skill set, we’re not influencing [the market] and we don’t know what we’ll be buying next. LT COL Joyce said that the speed of the rollout was also due to political will amongst senior leadership. The Phantom rollout, however, has not been without setbacks. It was temporarily delayed last year after the US military grounded its fleet over concerns that the Chinese-made drones were vulnerable to hacking. LT COL Joyce said soldiers were keen to get started.